They clearly get the visual model. Now, granted, it’s hard to apply this visual model when multiplying by “one and a half.” Still, there’s a clear attempt to work it out with pies, and then they wrote four. I mean, what’s going on? 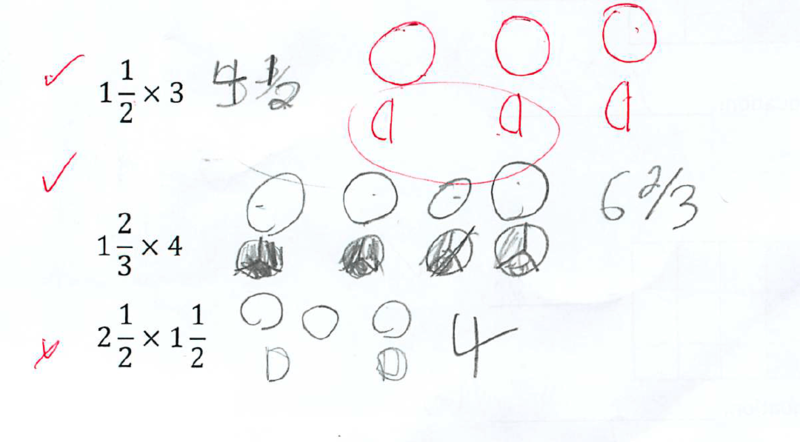 Maybe the kid was just adding instead of multiplying. After all, 2 and a half and 1 and a half makes 4. Maybe he forgot what operation he was working on. He was confused. But then you work your way through the stack of papers, and you see this mistake coming up a bunch. Why do kids that clearly get that we’re multiplying end up adding? You might say, hey, these were just guesses from students who were unable to grapple with a difficult problem. They just wrote anything down. You’re going to have to trust me, because I was there, that this wasn’t the case. These were kids who were, like, I’ve got this, what else you got? If you’ve followed my work for the last year or so, you know that I’m really into exponent mistakes. 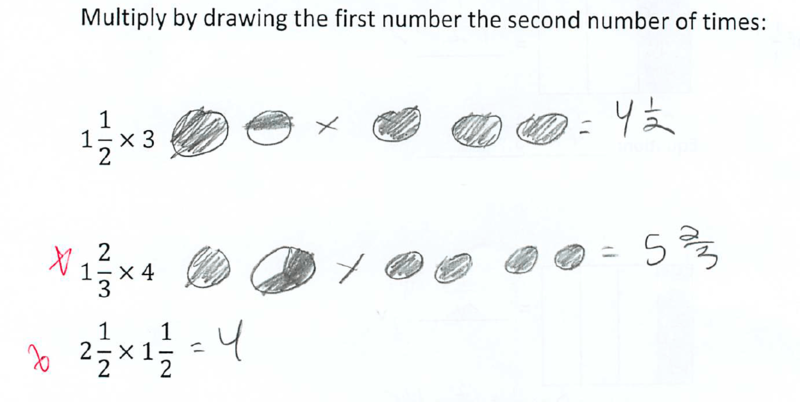 I’m inclined to connect this multiplying fractions error with some of the things that I’ve shown you all about exponents. This seems, to me, to be another situation where kids default to a computationally easier operation when faced with applying an operation in difficult context. Sometimes that’s exponentiation defaulting to multiplication, but here it’s multiplication defaulting to addition.